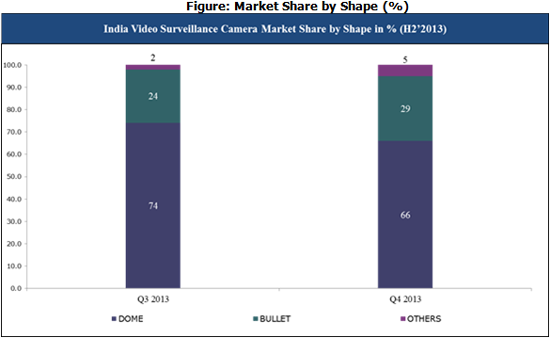 India Video Surveillance Camera market registered 20% increment in CY Q4 2013 over previous quarter. HIKVISION emerged as the new market leader. According to 6Wresearch, India Video Surveillance Camera Market (VSC) bagged a Total Shipment of 0.80 Million Units in CY Q4 2013, representing a substantial increase of 20% over the previous quarter. HIKVISION emerged as the new market leader replacing CP-PLUS. In CY Q4 2013, HIKVISION witnessed a significant growth of 40% and emerged as the market leader. The demand for low cost video surveillance cameras have spurred the growth for these players in the Indian market. SMB is the key segment driving the growth of low cost video surveillance cameras. However, public infrastructure & government segments are creating the demand for high end cameras. HIKVISION and CP-PLUS collectively account for more than 37% of the total market share. Dome shape cameras accounts for 66% of the total market shipments. PTZ feature is available in around 23% of the total camera. 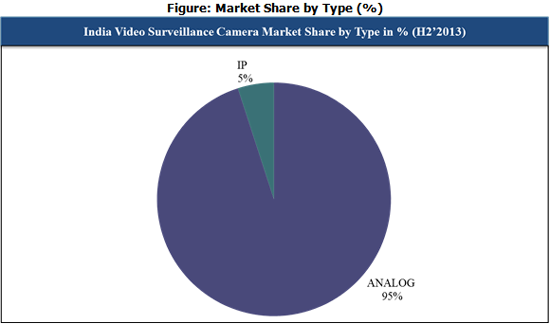 Source: 6Wresearch Quarterly India Video Surveillance Camera Market, CY Q4 2013. Others include Box, Pinhole, Standing, Cube, Ceiling and Mount shaped cameras. IP cameras are experiencing positive growth as a result of increasing need for advanced security. Also, due to the coming up of various metro rail, mono rail and airport projects, the demand for IP cameras are expected to reach a new level over the coming years. Apart from this, another key trend which is noticed in the Indian market is the growth of ONVIF cameras. ONVIF camera witnessed a substantial increase of around 49%, which means that Indian customers are now adopting standard cameras. Video analytics is also gaining momentum amongst the Indian customers, which registered a significant increase of 31% in CY Q4 2013.